Shopping for Xevoz Action Figures? Note: Hasbro has discontinued Xevoz. 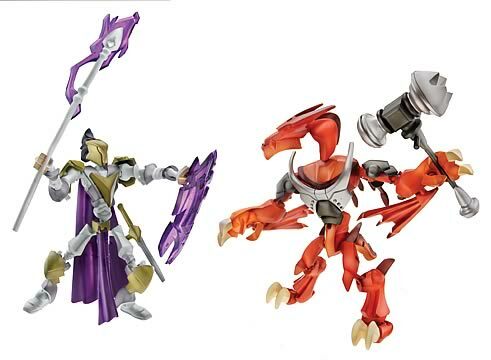 Once these Hasbro Xevoz items are gone, they'll be gone forever! Create your own action figures! Runeslayer vs. Firedrake (a.k.a. "Hammerdrake") is an incredible 2-pack that contains 2 unassembled 5-inch scale action figures: 1x Arcaster Runeslayer and 1x Reptosaur Firedrake. Each amazing character includes interchangeable parts, accessories, game components, decals, and a complete data file. This allows you to construct new and different-looking toys without using paint, glue, or anything but your own two hands and this bunch of plastic parts. Order yours to build and collect your own action figures! Custom-design your own unique action figure. Then fight it against a friend with Xevoz battling figure kits! The snap-together ball-and-socket system makes for easy assembly, outstanding poseability, and flexible interchangeability. Each character comes with an array of Power Parts-- the key to battle strategy. You decide which ones to include in your figure. Then construct a matching Battle Helix to roll like dice in combat with your opponent! Combine parts from multiple Xevoz kits and try out new character and Battle Helix configurations as your skills and strategy improve. It's a totally new challenge in every contest!